Using the first three months of publicly available data from NASA's TESS mission, scientists have confirmed a new planet known as HD 21749b, a "sub-Neptune" three times bigger and 23 times more massive than Earth. 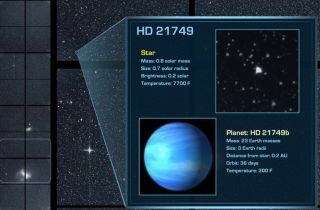 HD 21749b lies about 53 light-years from Earth and orbits a star about the the size of the sun. NASA's newest planet-hunting probe has bagged another alien world, the eighth confirmed find for the young mission. The Transiting Exoplanet Survey Satellite (TESS) has discovered a planet orbiting the star HD 21749, which lies about 53 light-years from Earth in the faint constellation Reticulum, scientists announced today (Jan. 7). "We think this planet wouldn't be as gaseous as Neptune or Uranus, which are mostly hydrogen and really puffy," discovery team leader Diana Dragomir, a postdoctoral researcher at the Massachusetts Institute of Technology's Kavli Institute for Astrophysics and Space Research, said in a statement. "The planet likely has a density of water, or a thick atmosphere." HD 21749b completes one orbit of its host star, which is nearly as bright as our sun, every 36 Earth days. The exoplanet likely has an average surface temperature around 300 degrees Fahrenheit (150 degrees Celsius), discovery team members said. The researchers also detected hints of another, smaller planet in the system, a planet that would have an orbital period of 7.8 days. If this world is confirmed, it will be the first roughly Earth-size planet found by TESS. NASA’s TESS mission, which will survey virtually the entire sky over its two-year prime mission, has already discovered three relatively small exoplanets around nearby stars. TESS launched to Earth orbit in April 2018 on a mission to find alien worlds circling stars in our solar system's neighborhood. Like NASA's recently deceased Kepler space telescope, which is responsible for about 70 percent of all known exoplanet discoveries to date, TESS uses the "transit method." That is, it looks for tiny dips in starlight caused when planets cross their host stars' faces from the satellite's perspective. This shifting focus makes it tough for TESS to find planets that lie far from their host stars and therefore take a long time to complete one orbit. Indeed, HD 21749b is very far-flung for TESS; two other smallish worlds found by the mission have orbital periods of 11 hours and 6.3 days, respectively. "It's the coolest small planet that we know of around a star this bright," Dragomir said. The team initially spotted an intriguing signal from the HD 21749 system in TESS's "sector 1" data. It was unclear whether this signal was caused by a planet or variations in the host star's activity, so Dragomir and her colleagues analyzed observations taken by another instrument, the High Accuracy Radial velocity Planet Searcher (HARPS), a spectrograph installed on a telescope at the European Southern Observatory's La Silla Observatory in Chile. A different group of astronomers had studied the HD 21749 system a decade ago using HARPS, which finds planets by noticing the tiny wobbles that their gravitational tugs induce in their host stars. Those researchers had also detected a signal, but they couldn't conclusively attribute it to a planet, Dragomir said. Dragomir and her team also used observations made by the Planet Finder Spectrograph, which is installed on the Magellan II Telescope in Chile, to confirm the discovery and help nail down HD 21749b's mass and orbital parameters. "There was quite some detective work involved, and the right people were there at the right time," Dragomir said. “But we were lucky and we caught the signals, and they were really clear." The researchers announced the find today at the 233rd meeting of the American Astronomical Society in Seattle. They have also submitted their discovery paper to Astrophysical Journal Letters. TESS is just getting started. The mission has already flagged several hundred planet candidates, and its confirmed finds will run into the thousands when all is said and done, NASA officials have said. And some of these worlds will be close enough to Earth for astronomers to study the planets using powerful instruments, such as NASA's $8.9 billion James Webb Space Telescope, which is scheduled to launch in 2021.